In the previous articles, we talked about the new Cisco 4000 Series ISR, such as Benefits You Get from Migrating to Cisco 4000 Series ISR, Ordering Guide-Optional Items, IOS Software Images and Licenses for the Cisco 4000 Series ISR and Cisco 4400 and 4300 Series Routers/Cisco 4000 Router Family Ordering Guide. 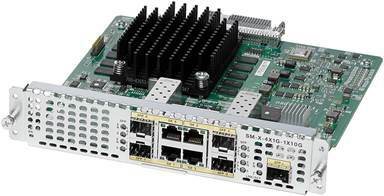 Now Cisco announced the new Gigabit Ethernet WAN Modules for the Cisco 4000 Series ISR. What are they used for and how to expand the function of Cisco 4000 ISR? Here we can refer to some main points that were released by Cisco. Cisco Gigabit Ethernet WAN Modules bring high-density Small Form-Factor Pluggable (SFP) and copper (RJ-45) 1 Gigabit and 10 Gigabit Ethernet (GE) connectivity to the Cisco 4000 Series ISRs. The modules accelerate applications such as Ethernet WAN access, inter-VLAN routing, and high-speed connectivity to LAN switches and servers. The ports on these modules work as routed Layer 3 ports. Layer 2 switching between local ports on the module or between ports on the module and other ports within the router system is not supported. The port terminates Layer 2 trunks from externally connected switches, and Layer 2 trunk and VLAN information is not switched onto other ports in the system. The host router routes all traffic entering these modules. Note: Cisco Gigabit Ethernet WAN Modules do not support Power over Ethernet (PoE). * Requires Cisco IOS XE Software Release 3.16. Auto-switchover and auto-failover are also supported on front-panel Gigabit Ethernet ports on the Cisco 4000 Series ISRs. ** For the classifications of packets on the input queue (to apply quality of service [QoS]), two types of classification methods are supported: based on either IPv4 and IPv6 or standard 802.1Q. These methods are mutually exclusive. The IPv4 and IPv6 classification rules can be enabled on up to three of the external ports. The same rules must apply to both IPv4 and IPv6 addresses. The 802.1Q-based classification is supported on all ports. The Cisco Gigabit Ethernet WAN Modules report the packet and byte statistics at an aggregate level per port. These statistics cannot be generated per VLAN. These measurements include policy drops, oversubscription drops, unicast, broadcast input, and output packet bytes or counts. Installation-How to Install the service modules and network modules? You can install service modules and network modules either before or after mounting the router. The 1- and 2-port NIMs also support the enhanced service module (SM-X) slot with an adaptor card. The Cisco Gigabit Ethernet WAN Modules support hard online insertion and removal (OIR). You can insert them into the router while the router is powered on. Warning: To comply with the Telcordia GR-1089 Network Equipment Building Standards (NEBS) for electromagnetic compatibility and safety, connect the Gigabit Ethernet ports only to intrabuilding or unexposed wiring or cable. The intrabuilding cable must be shielded and the shield must be grounded at both ends. The intrabuilding port(s) of the equipment or subassembly must not be metallically connected to interfaces that connect to the outside plant (OSP) or its wiring. The Cisco Gigabit Ethernet WAN Modules are generally supported on all Cisco 4000 Series ISRs subject to the availability of an appropriate slot. You may deploy as many modules as the platform slot density allows. 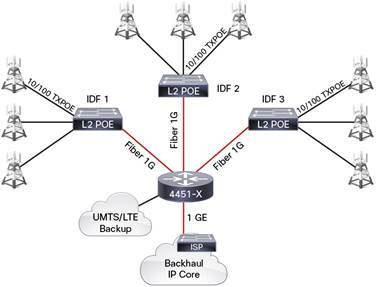 For specific details about platform, SFP, and Cisco IOS XE Software support, visit the Ethernet WAN section at: https://www.cisco.com/c/en/us/products/routers/4000-series-integrated-services-routers-isr/relevant-interfaces-and-modules.html. For configuration instructions, refer to the “Configuring Ethernet, Fast Ethernet, or Gigabit Ethernet Interfaces” chapter of Configuring LAN Interfaces. The guidelines in this chapter apply to all Cisco modular access routers. For more configuration instructions and other related documents, refer to the “Related Documents and Links” section on page 6 of that document. Note: Use the show diag command to check the hardware information of the Cisco Gigabit Ethernet WAN Service Modules. 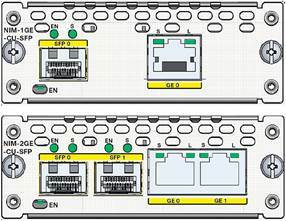 The Cisco Gigabit Ethernet WAN Modules have several EN (Enabled) or L (Link) LEDs located around the SFP and RJ-45 ports. The LEDs indicate that the module has passed its self-test and is available to the router. The Cisco Intelligent WAN (IWAN) solution enables customers to deploy new services faster regardless of transport model, whether it is a private WAN using a Multiprotocol Label Switching (MPLS) offering, a common Internet connection, or hybrid WAN access consisting of both models. The Cisco IWAN solution furthermore allows organizations to realize significant cost benefits from using the common Internet as the underlying WAN infrastructure. Using the Cisco Integrated Services Router with Application Experience (ISR-AX) services, based on application, endpoint, and network conditions, you can dynamically route traffic over multiple WAN connections in order to deliver the best-quality experience. The following figure demonstrates the use of the Cisco 1-Port 10 Gigabit Ethernet WAN Service Module as part of the Cisco IWAN solution. At the regional office, the Cisco 6-Port Gigabit Ethernet WAN Service Module aggregates the sub-rate Gigabit Ethernet WAN connections from different Internet service providers (ISPs). The remote branch-office routers connect to either one, or in some cases both, of those ISPs. The Cisco 6-Port Gigabit Ethernet WAN Service Module provides great flexibility, eliminates the need for a separate switch, and increases network reliability. 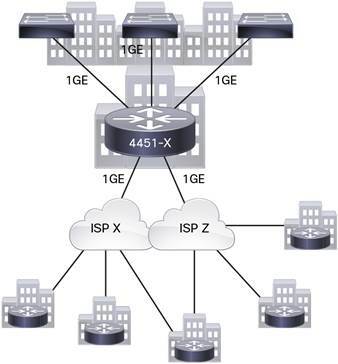 The combination of two service modules plus the 4 onboard ports can support up to 16 routed fiber ports in a single Cisco 4451-X chassis, adding superior scalability to intracampus networking connections. 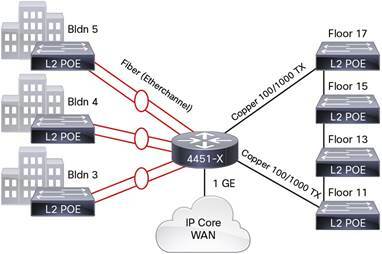 It demonstrates the use of the Cisco 6-Port Gigabit Ethernet WAN Service Module in a campus LAN environment with the mix of copper and fiber cabling options. The Cisco 4-Port Gigabit or 1-Port 10 Gigabit Ethernet WAN Service Modules provide fiber aggregation to links from multiple intermediate distribution frames (IDFs), again eliminating the need for a separate switch and reducing the number of devices to provision and manage. The Cisco Gigabit Ethernet WAN Service Modules are based on the technology of the onboard Gigabit Ethernet and SFP ports on the Cisco 4000 Series ISR. Feature support is therefore identical to that of the onboard ports. The physical and environmental specifications, respectively, of the Cisco Gigabit Ethernet WAN Service Modules. Dimensions (H x W x D) 1.25 x 3.50 x 7.24 in. (32 x 89 x 184 mm) 1.25 x 3.50 x 7.24 in. Ordering information for the Cisco Gigabit Ethernet WAN Service Modules you can refer to the following table.